Ah, my sweet Rowan! I am going to miss this quiet little doll. The kind of quiet that is almost eery, because you know something not very good is about to happen. The kind of doll that can pull down your pants, in public! If you thought Rowan was a very dainty lady, you were sorely wrong. She is a rascal!. Some dolls, like Rowan, take me long to understand. Their personality is a bit conflicting, and I am a little shaky when deciding what to make for them. Rowan loves deep navy, and she also loves sharp objects (but no scissors!). I think she wants to be a potter or a carver one day. How do I know? Because she was always fiddling with the chisels, trying to gouge marks here or there; begging the girls to give her some play clay so she could make something with it. I think Rowan will be a wonderful playmate to someone who likes to make things. Rowan is a 17" tall Figlette, a little cloth doll made with all natural materials. Her body is very petite, and there is a lot of mobility to her long and thin limbs. She is made with cotton interlock, made specifically for this kind of dollmaking, and is stuffed quite firmly with carded, clean wool. Her hair is made with horse hair, in a wefted style, which allows for a lot of styling and play opportunities. Her hair is a bit wild, and very thick. Rowan, like all my Figlettes, has a little bit more sculpted features, and also has little ears. She can be handwashed, and will withstand many years of kind play. Her care instructions will be emailed to you once I ship her your way. Rowan is wearing a long cotton dress, with puffy long sleeves and peter pan collar. The dress has gathered skirt and closes on back with three vintage glass buttons. 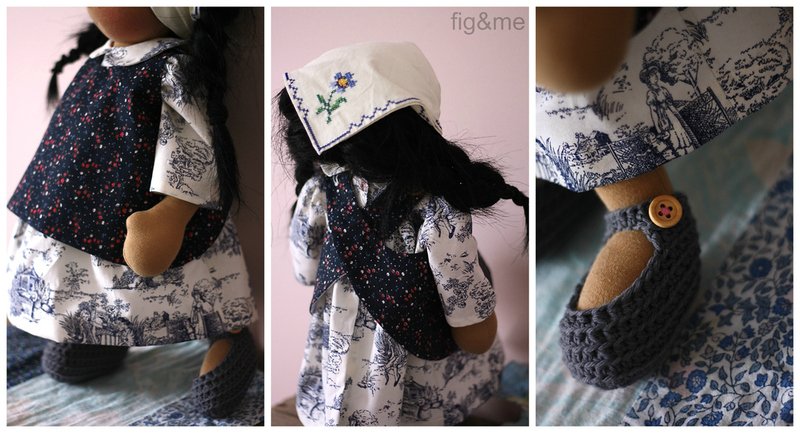 Her grey mary janes have been crocheted with wool, and close with two wooden buttons. Her underwear is made of cotton jersey and have elastic on legs and waist for a perfect fit (she also refused to be photographed in her modesty, like her sister!). Rowan comes with an extra item of clothing, a simple pinafore made with cotton fabrics and wooden buttons, that crosses on back. As she is one of those busy-bodies, she found the little embroidered handkerchief and put it to good use to keep her wild hair off her face. I didn't make it, is a vintage treasure that was lying on my table. She likes it so I let her keep it. Thank you so much to everybody that offered Rowan a loving home. She finally made her choice (one of my daughters picked the name actually) and she should be going home shortly. We were very excited to see so many people volunteer to bring Rowan home! She was starting to brag a little and tease Serafina about it. Sisters!. Thank you again for all your support! (names of selected people are not disclosed for privacy reasons). Feb 23 Serafina, a handmade cloth doll.